Fans of American Pie, the so-called ‘song of the century’ were left reeling with disappointment today, after 16 pages of notes revealed that Don Mclean’s 8 1/2 minute epic is actually just about pies. The manuscript, which is to be auctioned at Christie’s, was expected to contain detailed annotations for some of the song’s stranger lyrical moments, providing commentary and explanation for phrases that have been puzzled over by fans for decades. 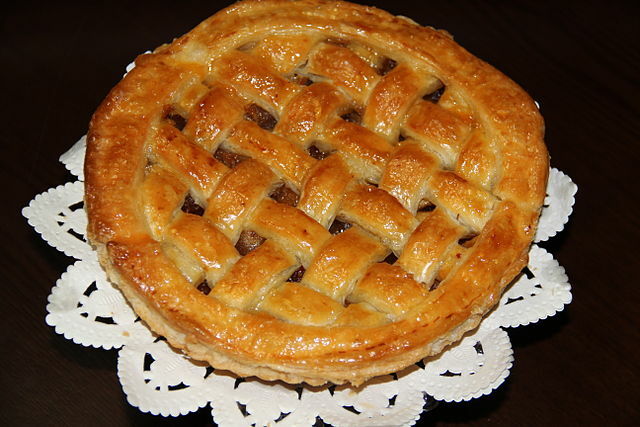 But, says auctioneer Leslie Fanshawe-Haines-Haines, the document is basically one very long list of the types of pie that Don Mclean was particularly fond of. Fanshawe-Haines-Haines said “My hands were shaking with excitement when I opened the package – here after all, is the makings of the sound of a generation, I thought. But then I read it, and the disappointment was both severe and immediate. “At first I thought I’d got the wrong parcel, or it was some sort of hoax, but a call to Don confirmed that this was the real deal. It’s literally just a list of pies, with some accompanying enthusiastic words of appreciation. Christie’s have confirmed that the manuscript also contains some suggestive remarks that may indicate Mclean engaged in sexual activities with pies, prefiguring the godawful Jason Biggs film by decades. Posted on April 7, 2015 at 10:58 am in Celebrity, Food, Music, Satire, Showbusiness, Society	| RSS feed You can	trackback	from your own site.